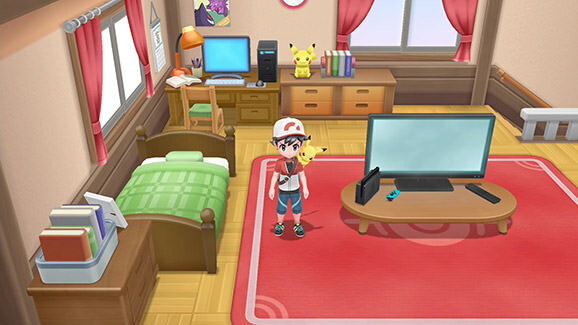 A new trailer and blog post were dropped today from The Pokémon Company detailing some of the features found in Pokémon: Let’s Go! Pikachu & Pokémon: Let’s Go! Eevee. First off, it is stated that the story found in the two versions will be identical, however the Pokémon found in the wild in each version have different rarity levels and some are even exclusive to that version. 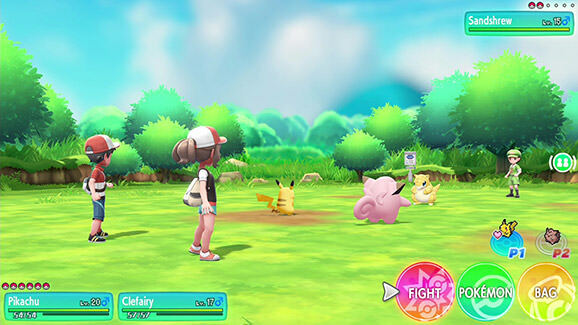 The example they give is that Oddish, Sandshrew, and Growlithe only appear in the Pikachu version, where Bellsprout, Vulpix, and Meowth will be exclusive to Eevee version. This carries on the tradition set in place by the other mainline Pokémon titles, so not much is new in that regard. In terms of catching Pokémon, you will now see wild Pokémon roaming around the world, and walking up to them will initiate the encounter. Wild battles are completely gone, and have been replaced with Pokémon GO style catching mechanics using motion controls via Joy-Con. Once you catch a wild Pokémon, your entire party will gain EXP to help level them up, which seems to work identically to other games in the series. Pokémon will learn new moves and evolve as they level up, and can then be used to battle trainers. Trainer battles are the main thing that seem to have remained truly intact. When a trainer spots you, they will challenge you to a battle. The battle system works just as longtime fans of the mainline RPG’s would expect. Defeating trainers will reward you with EXP and money, and sometimes even with Poké balls. 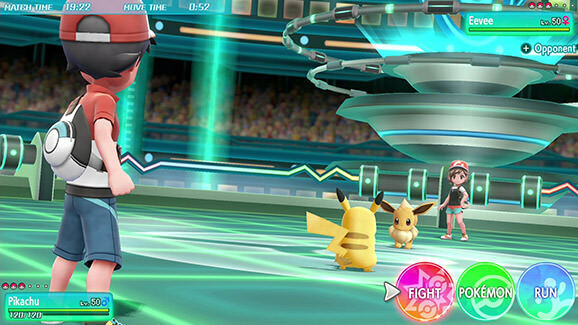 Gym battles also work as they did in the past, although they have much more detail. For example, Brock’s gym now has audience members watching and the extra detail really adds to the experience, especially for longtime fans and viewers of the anime series. Misty was also shown, and her new design and gym look fantastic as well. You will also have a ‘friendly rival’ throughout the game, so don’t expect him to be as rude as Blue was in the originals. The Pikachu or Eevee you start with depending on your version will be able to be customized with outfits, as well as the trainer you play as. 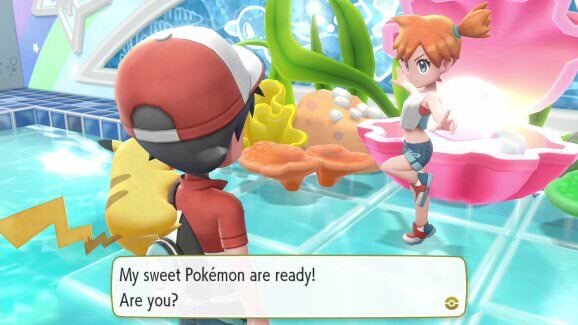 You’ll even be able to match outfits with your partner Pokémon. In addition, you can pet and feed them, which will increase your bond with that Pokémon. Not much is known about this bond, but it is said that “good things will happen as the two of you become closer”. Finally, online and local play will be present in the two versions. This will be more limited than recent releases, but will allow you to battle with friends, as well as trade Pokémon. This will be the only way to get Pokémon that are exclusive to the other edition. The online features will require a subscription to the Nintendo Online service that is slated to start this September. It will also be possible to play co-op locally in a new mode called Support Play, where you and another player can team up and play through the entire game together. You will both have Pokémon following you, and will be able to have double battles and even catch Pokémon using two Poké balls. The more that is shown on this game seems to be giving some hope to fans that are missing the wild Pokémon battles, myself included. While it’s unfortunate that wild battles aren’t in, I’m starting to like this new take on the series and think it will do a fine job of introducing players to the series in time for 2019’s core title. I’ll be grabbing the Eevee edition come launch day, which version will you be picking up? Pokémon: Let’s Go! Pikachu & Pokémon: Let’s Go! Eevee release November 16th.